On the 21st (Sun), explore the wealth of natural beauty at Natural Bridge. To see more things to do, traveler tips, reviews, and tourist information, refer to the Gold Coast road trip planning app . Melbourne to Gold Coast is an approximately 4-hour flight. You can also do a combination of flight and train; or drive. Traveling from Melbourne in April, things will get somewhat warmer in Gold Coast: highs are around 30°C and lows about 19°C. Finish your sightseeing early on the 21st (Sun) so you can drive to Brisbane. To see other places to visit, reviews, and other tourist information, you can read our Brisbane tour itinerary planner. Getting from Gold Coast to Brisbane by car takes about an hour. Other options: take a bus; or take a train. April in Brisbane sees daily highs of 30°C and lows of 19°C at night. On the 22nd (Mon), you'll travel to Noosa. 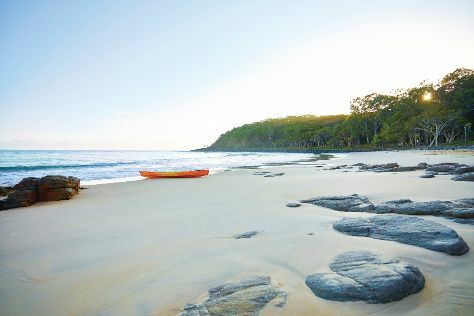 On the 22nd (Mon), explore the striking landscape of Noosa National Park. Get ready for a full day of sightseeing on the next day: examine the collection at Gympie Gold Mining and Historical Museum, enjoy the sand and surf at Marcoola Beach, and then look for all kinds of wild species at Buderim Forest Park. To find traveler tips, photos, more things to do, and other tourist information, use the Noosa journey planner . Traveling by car from Brisbane to Noosa takes 2 hours. Alternatively, you can take a train; or take a bus. Cap off your sightseeing on the 23rd (Tue) early enough to go by car to Brisbane. Your cultural itinerary includes sights like Boggo Road Gaol (Jail) and Old St Stephen's Catholic Church (Pugin Chapel). Visit Dicky Beach and Shorncliffe Beach for some beach relaxation. Explore Brisbane further: look for all kinds of wild species at Lone Pine Koala Sanctuary, get in on the family fun at Wheel of Brisbane, wander the streets of West End, and stroll through Moffat Beach. To find where to stay, reviews, ratings, and other tourist information, refer to the Brisbane trip itinerary website . Traveling by car from Noosa to Brisbane takes 2 hours. Alternatively, you can take a train; or take a bus. Finish your sightseeing early on the 27th (Sat) so you can travel back home.